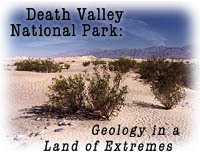 "Death Valley National Park: Geology in a Land of Extremes"; RealAudio interview with Allen Galzner, geologist and author of "Geology Underfoot in Death Valley and Owens Valley; and in "Try This: Crystal Creations", learn to grow your own salt crystals. "Project SERENDIP: Searching for Life in the Cosmos"; RealAudio interview with Dan Werthimer on the search for extraterrestrials; and "Try This: Build Your Own Solar System"; plus, find out your weight on other planets. "How Far Can You Hit One? The Science Behind a Home Run"; RealAudio interview with San Francisco Giants catcher, Brian Johnson; and "Try This: Finding the Sweet Spot"
"Stanley Falkow: Microbe Spy"; Real Audio interview with the president of the American Society of Microbiology; and "Try This; What's in My Root Beer?" "A Memory Artist: Painting to Remember"; RealAudio interview with Oliver Sachs, author of An Anthropologist on Mars , speaking on Franco Magnani's remarkable "memory paintings"; and "Try This: If You're Going to Rob a Bank, Wear a Wig"
"The Cloning Question: Is Making Clones Making Trouble? "; Join an online discussion: "Should animals be cloned for food and/or human disease research? Is it acceptable to clone humans? ; and online exhibit, "Try This: Mutant Fruit Flies"
"Discovering the Amazon: The World's Greatest River", a first-person travelogue with photos, links, and more; and online exhibit, "Try This: Disappearing Act", find out how "blending in" can help animals survive. Issue #15: "Looking for Planets in All the Right Places," "Science Explorer" activities, "Exploratorium visitors give their points of view"
Issue #13: "Sausalito Bay Model Goes With the Flow," "Straws and Pins Building Up Activity," "Exploratorium Roof CAM," "Teachers Explore Scale and Structure"
Issue #11: SPECIAL ISSUE: "Study Finds Evidence That Mars Had Life," "Mars Sites Multiply"
Issue #9: "Satellite Photographs Auroras from Space", "Researcher Say Wetlands Can Purify Themselves" "Another Free NASA CD-ROM!" Issue #7: "Emerging Viruses Audio Lecture Series", "Comet Hyakutake: Brightest in Decades" "Free NASA CD-ROM"
Issue #5: "Exclusive Interview with Dan Werthimer of SERENDIP" "Weird Winter Weather: A Sign of Global Change?" Issue #3: "NASA's Galileo Mission Successful" "Exclusive Audio Interview with Astronomer Geoffrey Marcy"
Issue #1 : "Nobel Prize Winners in Physics and Chemistry" "Presidential Visit to the Exploratorium"
Issue #14: "Whirling in the Wind: From Windmills to Whirligigs," "Depth Spinner" and "Squirming Palm" downloadable exhibits, "Palace of Fine Arts Historic Footage video stream"
Issue #12: "Automobile Industry Celebrates 100 Years", "A Visit to Smitty's Transmission Service", "Balloon Blow-Up", "Cycles Exhibition"
Issue #10: "New Exhibition Revolves Around Indoor Twister", "Brain Studies Lead to Key Discoveries" "Do It Yourself Science: Vortex!" Issue #8: "Hubble Space Telescope: Progress in Measuring Expansion of Universe", "AIDS Discovery: Research Milestone" "The Doppler Effect"
Issue #6: "NetDay '96: California Wires Schools", "Exploratorium Celebrates Pi Day!" "Hubble Reveals Surface of Pluto"
Issue #4: "Hubble Telescope Finds 1,500 Galaxies" "After Long Delay Galileo Data to be Made Public"
Issue #2: "Galileo Spacecraft Nearing Jupiter" "Astonomers Confirm: Planet Exists Outside of our Solar System"